Texas has long been fertile ground for outstanding blues musicians. It has carved a tremendous niche in the history of the genre, stretching back to Blind Lemon Jefferson, Blind Willie Johnson, and Lightnin’ Hopkins. It’s still serving as a birthplace for so many newer artists, too. So it was only natural that Italian bluesman Fabrizio Poggi has held a life-long goal to perform and record with the musicians of the Lone Star State. Poggi is a Blues Music Award nominated harmonica player, with twenty recordings and four books under his belt. He has collaborated with quite a number of great musicians over the years, including the likes of Ronnie Earl, Sonny Landreth, Charlie Musselwhite, Marcia Ball, and Otis Taylor to name but a few. 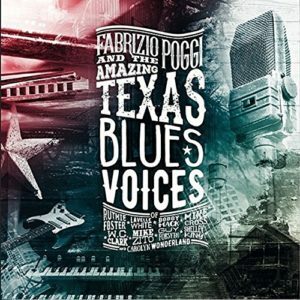 So it should be no surprise that making his dream come true of working with some of Texas best saw some of its favorite sons and daughters jumping at the chance — the result is Poggi’s newest release, Texas Blues Voices. Heading down to Austin and working with famed Grammy winning engineer Stuart Sullivan, Poggi rounded up a handful of the city’s best musicians to work as his core band: guitarists Bobby Mack and Joe Forlini, keyboardist Cole El-Saleh, and the rhythm section of bassist Donnie Price and drummer Dony Winn. The dream team of guests that he pulled into the mix are all over the top, offering a selection of covers and a few songs written by the artists performing. Stand-out numbers on the disc would have to include Ruthie Foster singing Sonny Terry & Brownie McGhee’s “Walk On,” Lavelle White working her song “Mississippi, My Home” with Carolyn Wonderland and Bobby Mack inserting terrific guitar solos, Shelley King’s is sensational on her piece “Welcome Home,” and Guy Forsythe’s resonator guitar playing on the traditional “Run On.” All of the performances are outstanding. Other musicians appearing are Mike Zito, Mike Cross and WC Clark. And Fabrizio Poggi blows some dynamic harmonica throughout. If you have not been exposed to Fabrizio Poggi before, this is a superb disc to get your introduction. Filled with amazing playing by everybody in the mix. And it’s got a nice history of Texas blues going on, too. Texas Blues Voices is definitely something to put on your list to take a listen to. You won’t be sorry.